1 x Atmel ATtiny13 MCU – can use either PDIP8 (8P3 version) or SOIC-8 ( 8S2 – EIAJ SOIC 0.209″ wide SMT part or S8S1 – JEDEC SOIC .150″ wide SMT ) – the ATtiny13 chips come in many flavors and it’s best to figure out which one you’ll be using because this project can be built around the MCU. The following project description assumes the through-th-hole PDIP body. If you are using the cheaper and much smaller SMT versions of ATtiny13 (a great idea, BTW!) 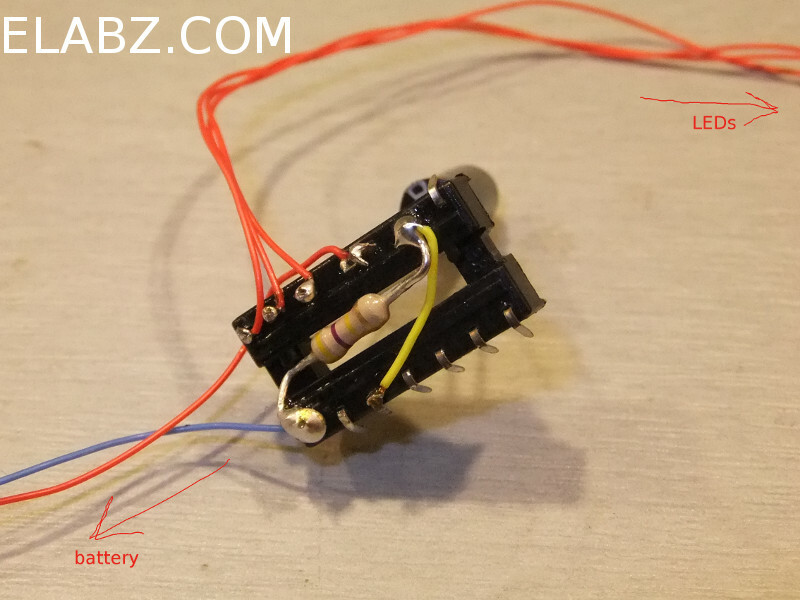 – check the other LED blinker I described in the other post here for the chip mounting and circuit building ideas. 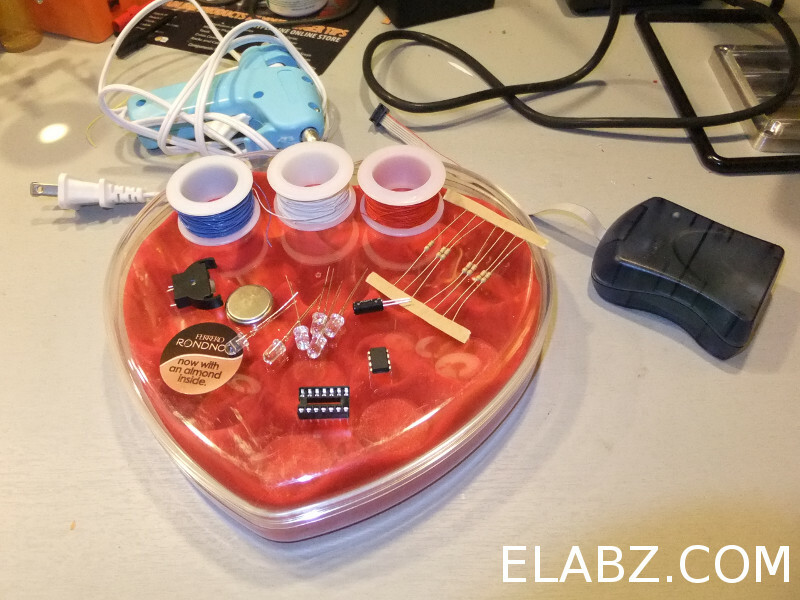 6 x Red LEDs – I’m sure everyone’s parts bin has a few (dozens), just make sure they are the newer high-intensity (5000mcd+) ones because they need to be able to shine through the red plastic box liner. 1 x ball tilt (shaking) switch – this is the part that enables the MCU to go asleep while the box is laying on a table and come alive when someone takes it in their hands. A perf board (a blank development PCB) for the LEDs – the equal distance between the LEDs is important for POV displays and we’ll mount all 6 LEDs on the perf board so they are spread uniformly. 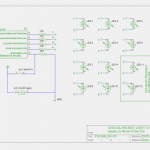 1 x 470 KOhm – pullup resistor for the ball tilt switch. The higher the value, the less current flows when the switch is closed – useful for longer battery life. 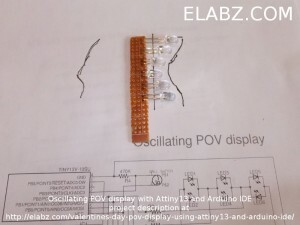 I started with building the LED module on a strip of perforated breadboard PCB. As you can see, the LEDs are not on one vertical line. They have to shine through the red plastic liner in the box. 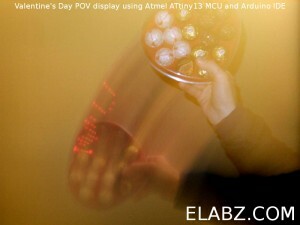 The liner is not flat, it has peaks and valley (in which the chocolates sit) and I knew from my earlier projects that if the distance between the LED and the material of the liner is different, it will result in the different size of the spot of light at the front surface of the liner – the further away the LED the larger the light spot. For POV effect to work, the light spots have to be as uniform as possible, so I ended up tracing the profile of one of the spots that was long enough to put 6 LED in it, and formed the legs of the LEDs to the required height, drawn on the piece of paper under the board on the left. I used the space left on the PCB for mounting the current limiting resistors and all of the wiring that connects Charlieplexed LEDs to each other. This is pretty much the most cumbersome part of any Charlieplexed LED project and if you have that out of the way, the rest of the circuit will be very easy. Next step is to wire the the battery holder to the proper pins on the IC socket. Keep in mind that the 8-pin ATtiny13 will sit in the 14-pin socket moved to one side of it and the extra 6 pins will be used for mounting the ball tilt switch and its pull up resistor. So, the positive side of the battery actually goes to pin #11 on the socket and the negative – #7. This is the only part of the wiring where I have used blue wire – it would be pretty bad to switch the polarity and so I’ve used it to indicate the negative wire. Positive and negative terminals of the battery holder are clearly marked so you know which wire goes where. Here we solder the 470K Ohm resistor and the ball switch (facing away from the camera, sorry, not a great angle) as well as the battery and the three wires to the LED strip we’ve prepared earlier. The 30AWG wire I used is so thin that I pretty much just wire-wrapped the legs of the IC socket with the 30gauge wires and soldering them once wrapped was a breeze. When you are done soldering all the connections on the IC socket, I would recommend bending all the legs of it up to lower the profile of the completed unit – the box is small and space is at premium. Picture on the left shows the three parts of the complete device positioned in place just before they were hot-glued in place. Note the location of the LED strip (top left-center) – this was one of the only two “valleys” in this box long and straight enough to house six 5mm LEDs in a row and the LEDs’ heights were profiled accordingly, so this is the only place in the box to put it in, The rest of the part can go anywhere the space is large enough to accept them. And important note about the positioning of the ball tilt switch. As will all my LED blinker projects that include motion detection, the switch should be positioned so that the ball rolls into the part of the switch furthest from the contacts when the box is in it’s normal rest position (flat on the table). In this case there’s no current flowing through the switch, which is ideal for power consumption. When someone picks the box up, the ball rolls back towards its leads and closes the contact, so the current starts flowing. It’s not a huge current (which is why we picked a high value 470K resistor) but it’s better to be avoided anyway. Also important is that the software times each scan of the message to the ball tilt switch closing event – because it’s an oscillating POV display (unless you can continuously rotate the box with your hand, it had to be! ), you don’t want to show the message on the way back because it will be flipped horizontally (i.e. mirror image). Because all three symbols used – I, ❤ and U are all symmetrical, perhaps it would not be too bad to show a message that would read something like I ❤ U U ❤ I – sounds rather sweet (although does not make sense grammatically) – but I wanted a more universal display that could show some other symbols, too, and those may not be symmetrical. So the software uses the ball tilt switch to watch for the proper direction of the swing and so the ball switch should be facing toward the direction in which the message will be shown – i.e. to the right hand side when the box is upright. Note that on the pictures it’s upside down – just to eliminate any confusion. When you are gluing the battery holder in place, keep in mind that you may want to change the battery in the future, so leave the top opening of the battery clear of any glue residue. 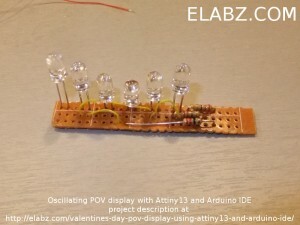 Same goes for the ATtiny13 – you may want to avoid gluing it permanently just in case you need the chip in the future. Use only low temperature hot glue sticks or the glue may melt the thin plastic liner. When you’re done with the hot glue, flip the box over, load with chocolate and give it to someone who deserves it! A small note on actually using the device – the software is trying to find the average duration of the swing (back and fourth) and starts the scan after 1/8th of the complete cycle has passed since the ball switch had its contact closed (and de-bouncing time expired) i.e. 1/4th of one forward swing, which was my crude attempt at centering the message inside the width of your swing. This works when you’ve already moved it back and forth three-four times but it may make the first couple of swings look weird (squished) – that’s because the average time has yet to calculate properly. Since it starts from zero, it needs a few iterations to resemble the actual average. Several things could have been done to alleviate this issue but I have hit a very hard limit in ATtiny13 – the amount of flash memory available for the program. The sketch below compiles to 1006 bytes and ATtiny13 can only keep 1024, so I was really counting individual bytes here and could not avoid the issue of average swing duration. Once something crude and simple like what’s in there could actually fit into the memory. I would be delighted if someone takes the hardware and this early version of the software and comes up with a way to pretty the display a little – and finding the proper time to start the scan every time is the first issue I would start looking at if you want to improve the project. As I mentioned, the sketch uses up 1006 bytes out of 1024, and so we can fit 18 more lines of scan in there which can enable slightly longer messages, such as I ❤ NYC and perhaps even I ❤ BEER. Not sure about the latter, but I tried to fit my wife’s name in there (5 letters) and couldn’t, so I just stopped trying. 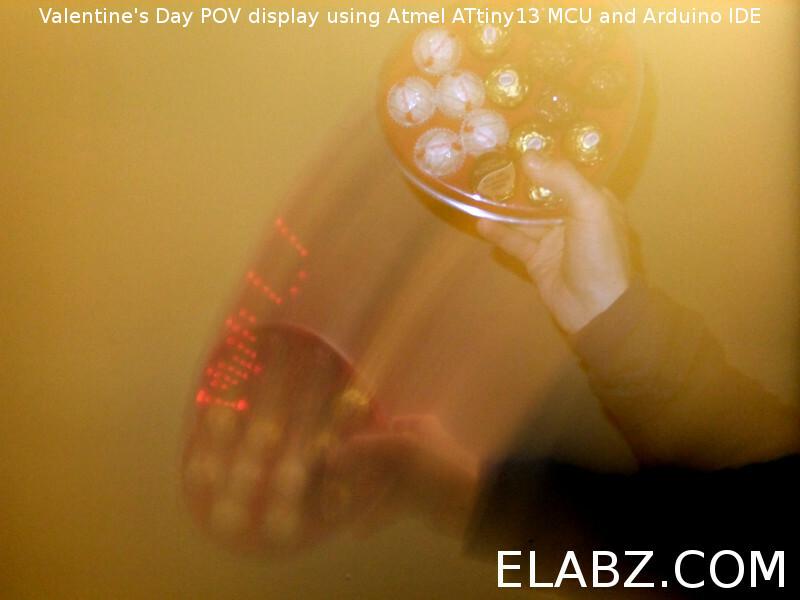 But if you’re looking for more like St. Patty’s type display than St. Valentine’s :), you can easily replace red LEDs with green and try to spell I ❤ BEER following the easy coding instructions in the comments to the sketch – do let me know if it worked! 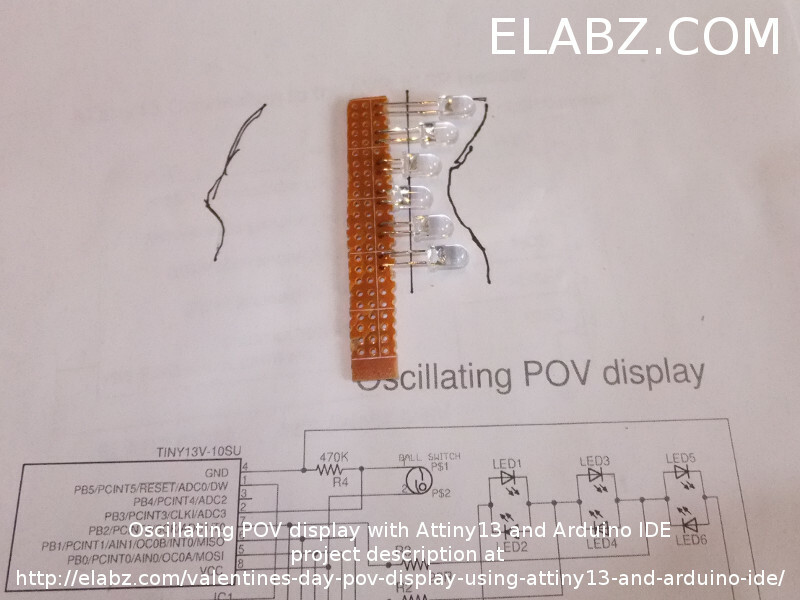 If you need help loading Arduino sketches into ATtiny13 MCUs, see this post on using Attiny13 with Arduino IDE here. Above is the zipped sketch and supporting Eagle schematics and board files (note that I haven’t received the boards yet so it’s not yet a proven design). And here below is the listing of the sketch’s C program – please read the comments for any customization ideas (such as those other messages for example). If you end up making your own version of this project, I would be delighted to see it! Please be sure to contact be or post a message in the Projects board of the forums. 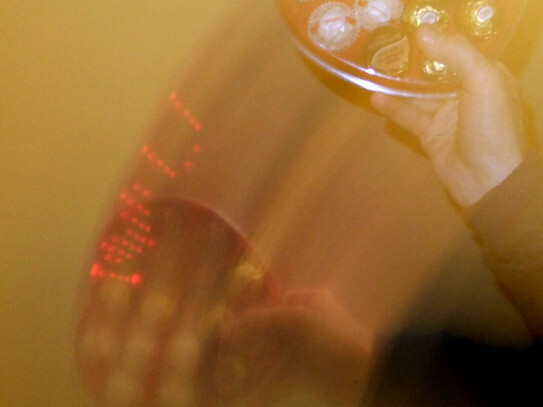 Program code for the Pimp Your Chocolates project. know it was of some use. I'll also be happy to feature your project on my site, so send some pictures, too. to light the LED the D0 has to ho HIGH and D1 - LOW, so the LED's anode is facing D0. LED #2 is between the same legs but in reverse. LED #3 is between D0 and D2, LED #4 is the same legs but in reverse and so on. //    DDRB = 0B00000000; // dont show anything on the way back else it will be mirrored! Not sure where to get a ball tilt switch though. I got the first one from a Brita (or was it PUR?) water filtering jar. It was used for counting tilts of the jar when you pour water to tell when the filter needs changing. Then eBay of course. $0.50 each from China. Re: byte debounceDelay = 50000; // microseconds good catch! I wonder if it assigned 255 or 0 due to wrong type? I’ll go change it to int and see what happens. I have a feeling I’m going to need 5,000 mks (5ms) for debouncing not 50,000 if even that. 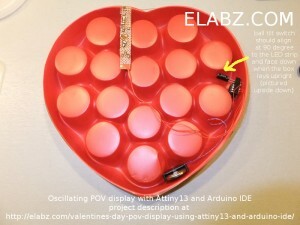 I’m trying to use this project to win my girlfriend’s love back. It’s very important to me! Filipe, I feel your pain. I’ll try to help you achieve your noble goal! The errors you are seeing are the result of the missing sleep.h library or a missing reference to it. Basically, it’s a part of the code that makes the ATtiny go to sleep after the display has been laying still for awhile. You can do away with these functions and simply make it always On or add a power switch into the circuit but I don’t see a reason why not just make the MCU go to sleep by itself. I just picked up the display I put a new battery into back in February 2013 and didn’t touch since, and it’s still alive and working! Hope this helps, let me know if it’s still a no-go. The issue may be with a different name of the library (unlikely tho) – I will have to get the proper version of the Arduino IDE to investigate further. This code is written for an Attiny13. You are compiling for an Arduino board. Is that deliberate? If so, you will need to mod the code to run on a Arduino board. I’m new to this. Can you help me step by step? I bought an arduino leonardo 3 weeks ago. 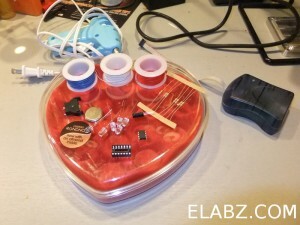 This week I found out your project and tried to get all the components at the local electronic’s store. I couldn’t get the attiny13 nor the ball switch. Instead I got the attiny85 and a mercury switch. I also have the avrisp mk2. Now I have the IDE 1.0.2 since that’s the one you use. Next, I add the hardware folder to the sketchbook folder with the attiny85 folder inside. The attiny85 is detected, but I’m getting a new error: ‘byte’ does not name for a type. What can do to fix this? I really don’t I have much time to put this together. Your help is much needed!!!! Can you please post the changes in the code? I also new to programming. Filipe, are you sure you’ve installed support for Attiny85 properly? It has its own core, different from smeezeklitty’s Attiny13 I used here, so you will need to follow procedure from here: http://hlt.media.mit.edu/?p=1695 to properly install support for Attiny85. Good news though – I don’t think any changes to the code are actually needed, as long as Arduino IDE knows how to handle the actual chip being used. I don’t think I have an 85 in my stash at the moment, so can’t really help in debugging the code on it, but, again, I don’t anticipate any changes to the code. One other note: be careful with that mercury switch! In order for the image to show well, you need to shake the board rather vigorously (see videos) and the mercury switches I’ve seen look a bit too unsafe with a pretty heavy chunk of mercury bobbling about in a glass vial. Spraying your gf with mercury from a broken vial will not be very conducive to patching up the relationship. I would simply forgo the switch and make the program loop indefinitely instead of responding to the interrupt. Thank you very for the help you been giving me! I was using old MIT’s core. That was getting me into errors when compiling. 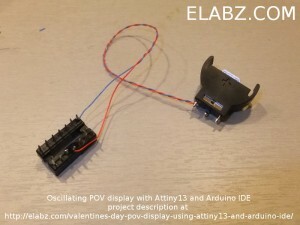 After several hours trying to make the programmer work on Windows8, I connected the programmer to the attiny85 as shown it your schematics, but it took 25 minutes to upload the code. The attiny85 was set to run at 1MHz. Can the upload process be faster or am I doing something wrong? I made the board and mounted the components. If hold the board by the battery side the characters appear upside down and backwords. Can you tell what changes I have to do in the code to fix this?